GUNMEN have again shot down hopes of a less violent and homicidal 2008, having killed four people and wounding three on New Year's Day yesterday. 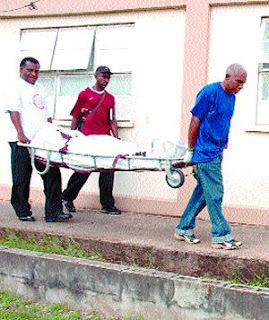 The killings of 2007 continued into January 1, with a total eight murders between Old and New Year's Days, in addition to the discovery of the decomposing body of a woman yesterday, who police believe was raped and killed. Three of the four murders recorded for 2008 were gang related and one man was killed during an argument over a girl. On Old Year's Day, two of the homicides were gang related. One man was killed for refusing to pay a debt and a witness in a murder case was shot dead. Of those shot and injured were a 12-year-old boy hit by a stray bullet, a woman whose boyfriend was murdered and a Laventille man. The first to be killed for the year was Damien Charles, 26, who was shot dead around 12.40 a.m. at Production Avenue, Sea Lots. Police said Charles was a criminal and his murder is believed to have been caused by a fallout over a State-run project in Production Avenue. His killing was said to be linked to that of Brian Ramnath, who was also killed at Production Avenue four days ago. Police said a contract was given to a Pioneer Drive resident and criminals from Production Avenue opposed to the move decided to settle the score with murder. Second on the killers' list was Shervon Lambkin, who was killed in his bed around 3.10 a.m. Gunmen broke down the bedroom door to Lambkin's Thompson Trace, Never Dirty, Morvant, home and shot him twice. Police said Lambkin was a known member of a gang in the area and his killing was linked to criminal activity. Two hours later, Junior Phillip, 18, was shot five times, twice in the head, after a tiff with a man he bumped into while dancing with his girlfriend at a pub. Marina Smith, 21, Phillip's girlfriend, was shot in the right thigh. Phillip, nicknamed Luda, who lived at Flemming Street, Longdenville, and Smith went to bring in the new year at the Mystic Pub in Chaguanas. The killing took place around 5.15 a.m. outside the pub. Around 8 a.m., a Gasparillo man going to look for a hoe handle in the bush found the decomposing body of a woman of Indian descent. The woman's top was off and her pair of pants were pulled down to below her knees. Her body was found in a ditch off Holder Trace, which is off Bhagwandeen Trace, Caratal Road, Gasparillo. Police believe she was raped and killed. Investigators are seeking help to identify her. At Trou Macaque, Laventille, Andre Richardson, 27, died after a shotgun blast to his head. He was killed in his apartment in the plannings at around 11.45 a.m.
Two gunmen, one with a pistol and the other with a shotgun, kicked in the front door and murdered Richardson. Before they killed Richardson, the gunmen beat and robbed an off-duty soldier. Investigators, including Insps Sahadeo Singh and Michael Modeste, said Richardson was involved in criminal activities. Last year, his brother, Ayo Richardson, was also murdered. Then around 2 p.m., Akeem Samuel was shot in the head and belly while at his Evans Trace, Block 22, Trou Macaque, home. He was listed in critical condition at the Port of Spain General Hospital last night. Police believe the same gunmen who murdered Richardson may be the ones who shot Samuel. On Old Year's Day, the first to be murdered was Mark Wellington, 30, a witness in a murder case. He died at hospital after being shot. Then around 8.30 p.m., Sherwin Akres, 28, was killed outside his Petunia Avenue, Morvant, home. The PH driver was shot several times. Investigators, including Cpl Vidal, PC Shawn Hoyte and the Homicide Bureau, believe his death was linked to a $10,000 debt he was owing. Around 11 p.m., Neil Armstrong, 22, was shot dead outside his Tumpuna Villas, Malabar home. His body was found in a drain. Armstrong had several pending firearm and robbery related charges and police believe his murder was linked to his involvement in crime. At Mt D'or, Champs Fleurs, murder suspect Steve Williams, 47, was shot dead around 11.45 p.m.
Williams was shot multiple times while liming at the corners of Oliver Trace and Mt D'or Road and died on arrival at hospital. Williams's brother, Robert Williams, was shot dead on December 19. Williams, who was a suspect in a double murder at a bar in Curepe, was questioned by police but released because of a lack of prosecutable evidence. Their killings, before midnight on Old Year's night, saw the 2007 murder toll ending at a record 395. Anyone with information on any of the murders can call 555, Crime Stoppers at 800-8477, the Homicide Bureau at 625-2877, 640-1738, 652-0495 or the nearest police station. 8 murders in 24 hours, a good night's work for the criminals wouldn't you say? It's a new year but it's the same old story. Is this what we have to look forward to in 2020? For that matter, how many of us will still be alive to see the year 2020, if murders continue unabated as they are going right now? Looks like the criminal element in this country is fearless of the law and of the officers of the law. Where did we go wrong? Could it be that the law enforcement agencies of Trinidad & Tobago are seen as just another arm of the PNM Government? Could it be that PNM Prime Minister, Patrick Manning's Crowne Plaza dealings are coming back to haunt US, THE CITIZENS? Are we really heading for developed nation status in the year 2020? Which leader of any developed nation would appoint his wife a Senator and Minister in Government? Which developed nation would allow its Prime Minister to do this? Which developed nation would stand by as its Prime Minister has dinner and makes deals with known gang leaders in a posh hotel, paid for by state resources? Which developed nation would stand by as its Chief Justice is persecuted for doing his job? Which developed nation would stand by as a tainted Chief Magistrate is allowed to retain his position and salary? Which Government in any developed nation would allow a known terrorist to make threats to the public on a religious occasion? Which developed nation would stand idly by while Ministers, who are currently in office, are allowed to use state resources from on-going projects for their own benefit while the on-going projects come to a complete halt? Are we really heading for developed nation status in the year 2020 when we are breaking records for the number of murders in a calender year? Basdeo Panday: "I have been saying for the entire election that the Government's programme is geared towards creating criminality in the society. I have said that over and over. If the country doesn't want to listen, (then) don't listen. My job is to speak and their job is to ignore me if that is their wish. I have no sympathy for those who have been the victims of their own doing. They voted for the PNM, what did they expect? Honey and roses?" “Vision 2020 seems to be an altered skyline. I see the buildings all stacked up there and it looks like a little piece of New York. “But the Government should be building schools, houses, hospitals and police stations to bring social benefits to the people. PNM raising water rates after elections! Panday: What did PNM voters expect? This website is in no way affiliated with Basdeo Panday and does not in any way express the views of Basdeo Panday.